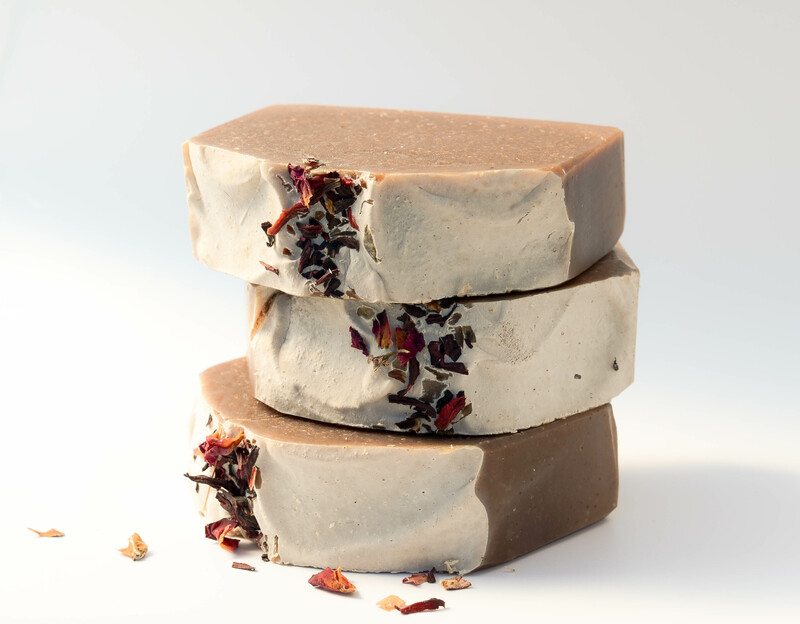 The theme of this month’s soap challenge is using an alternative liquid in making soap. 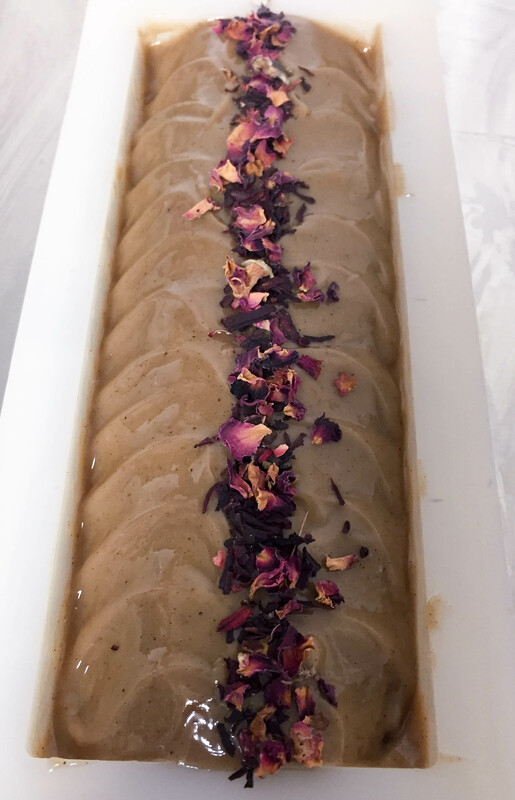 The guidelines: make a soap by replacing 100% of the liquid with something other than water and any colorants must be natural – no dyes, pigments, oxides or micas. Additionally we were required to research the benefits of the replacement – does it have any or is it just label appeal? Shortly after signing up for the challenge I happened to walk through the juice section of Fresh Market (my small town’s version of Whole Foods) and saw cactus juice. Without hesitating I decided that was the one. Finding information of the benefits proved to be more of a challenge. A search of cactus juice benefits turned up quite a few claims ranging from curing or preventing cancer, diabetes, inflammation, and hangovers. Not surprising that most of these sites were fronts for companies selling the juice but there were a few reputable sites that reported the health benefits as well: Mayo Clinic, LiveStrong.com, WebMD to name a few. 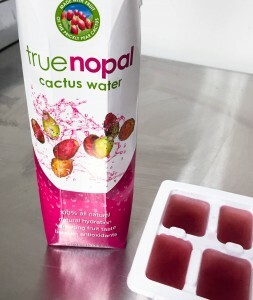 All of these of course resulted from drinking the juice or eating the prickly pear fruit. Most of the references to the benefits of cactus juice for the skin are found along with references to aloe vera. Something specific about skin care benefits was finally found in Allure magazine February 2015: “But prickly pear—which contains amino acids, vitamin B, calcium, beta-carotene, magnesium, and iron—is just as good slathered on your skin as it is ingested. That’s probably why it’s been making an appearance in so many skin-care products.” In conclusion, I believe adding cactus juice to soap equivalent to using aloe vera. Before making my soap, I had to try a little of the juice. It is not to my taste – especially with its price ($5 for 1 liter). I will not be buying it again for consumption. 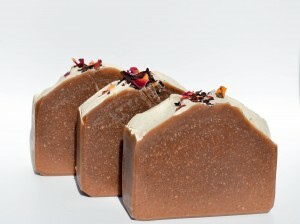 My vision was to make a green soap with a rounded top and a sprinkling of hibiscus and rose pedals. I researched what I could use as a natural green color and decided on comfrey powder because it was an ingredient that I had on hand. 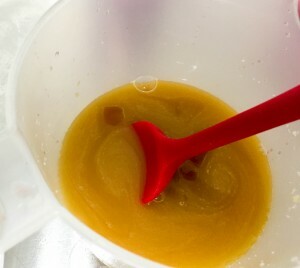 Although the sugar content was not very high, I decided to start by freezing the juice. 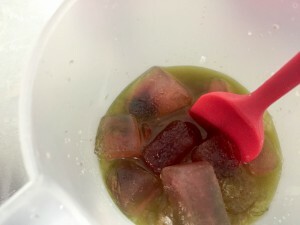 I was so excited when I started mixing the lye the pink started to turn green. Could the pink actually turn to green? I wanted the soap to be green! Too bad it turned tan. 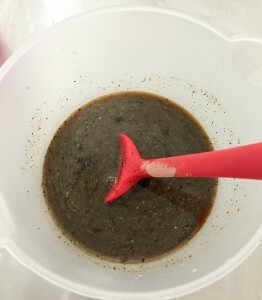 But lets add the comfrey powder – maybe we can still get green. Nothing to be done now except wait. Well we didn’t get a miracle – the soap is still brown. But I am starting to like it. It smells great – scented with a blend of citrus essential oils. Thanks Amy for another fun challenge. This is very interesting! I love the research you found on cactus juice! I’m sure the soap will be wonderful to use, even if it didn’t turn green. I had no idea the juice would be pink. I had visions of something clear like aloe, or at least light beige like the agave nectar. Thanks Amy. This juice is pink because it comes from the Prickly Pear fruit that grows on the cactus – the fruit is almost a hot pink color. Even though it wasn’t what you hoped for I love the color that evolved! How did you end up with the white tops? Thanks Debi – the white on top is soda ash. Not planned but I think it adds to the soap so I made on attempt to remove it as I normally would. I would never have thought of using the juice in soap. I do like eating the chopped up cactus that comes with some Mexican meals tho ; ) I do like the color your soap turned out – and how cool that the soda ash worked with your design. Neat! Thank you Eva. I have never had the shopped up cactus to eat, at least not that I know. I will have to look for it when I get Mexican food – it would be fun to try. Beautiful soap! I love the color that is in the final bars. And the ash gives it character. For what is worth, I like the colour it turned out to be. If it was me, I would consider it a blesing in disguise, the soda ash with the hibiscus flowers and the colour of the soap create such an striking and elegant result. Beautiful photography, too! Congratulations! Thank you Anna. It has grown on me and I do like the soap. It was just the disappointment of things not going the way I wanted.